My name is Lolly Galvin. I am the founder of Dignity Project & #phillystreetcuts. We provide haircuts and basic necessities to homeless people in Philadelphia. Brennon Jones, another barber from Haircut4Homeless, also provides free haircuts. This week he was told by a representative of Mayor Jim Kenney's office to stop cutting hair. Reasons cited were needing a vendor permit (even though he's not selling anything), health code violation, and traffic issues. I have been giving haircuts for over a year in Philadelphia with the help of stylists who volunteer their time and have seen the power of this simple gift. Mayor Kenney's decision will stop many people from looking and feeling better, while robbing them of an opportunity for much needed human connection. Philadelphia is a major US city and allowing government interference in acts of service sets a dangerous precedent. 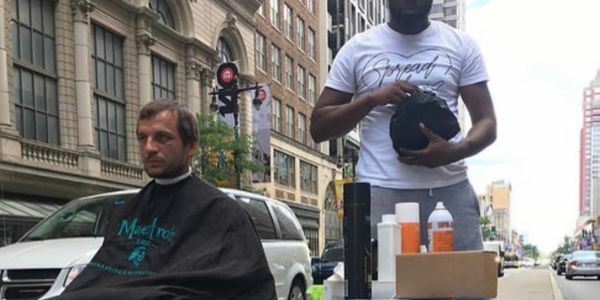 Please sign this petition to ask Mayor Jim Kenney to reconsider this decision and allow Brennon to continue providing free haircuts for the homeless. Help put Philadelphia on the map as a city that places morality and simple acts of compassion over technicalities. Another barber from Haircut4Homeless also provides free haircuts. This week he was told by a representative of your office to stop cutting hair. Reasons cited were needing a vendor permit (even though he's not selling anything), health code violation, and traffic issues. I have been giving haircuts for over a year in Philadelphia with the help of stylists who volunteer their time and have seen the power of this simple gift. Your decision will stop many people from looking and feeling better, while robbing them of an opportunity for much needed human connection. Philadelphia is a major US city and allowing government interference in acts of service sets a dangerous precedent. We ask you to reconsider this decision and put Philadelphia on the map as a city that places morality and simple acts of compassion over technicalities.